On its first full year, the Freemont had interesting results considering its price. Fiat sold around 38.000 units of this D-MPV in Europe, Brazil and China. Making use of the good demand the Journey had in these markets, Fiat launched the Freemont based on the same attributes of its twin brother: comfort, and a crossover spirit for looking for a SUV and a MPV at the same time. 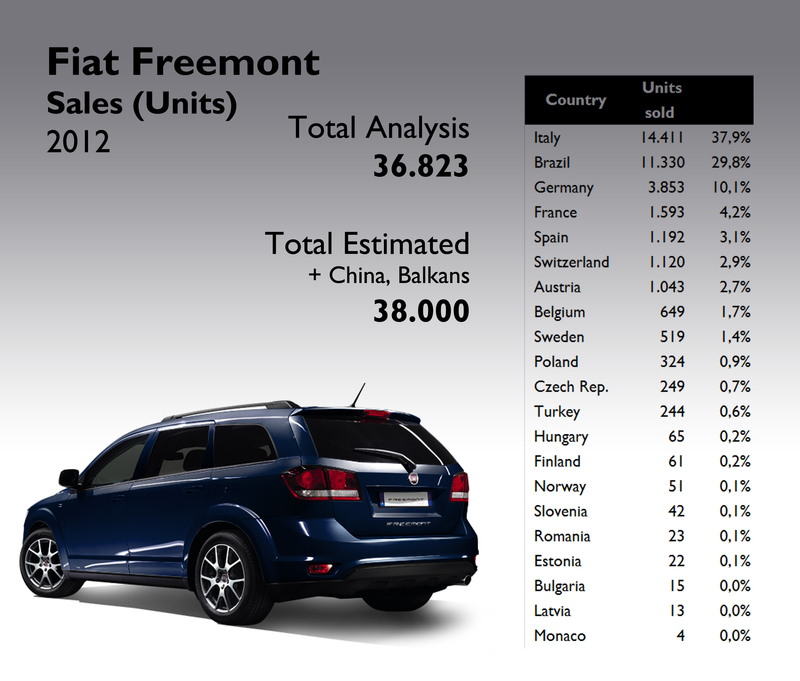 Italy was the largest market for the Freemont, counting for 38% of total sales. Brazil comes next with 30%, and is followed by Germany, France, and Spain. Besides the excellent position in A-Segment, and recently in B-MPV with the 500L, Fiat is one of the leaders in D-MPV thanks to the Freemont. In countries where the brand is quite unpopular/unknown, this Fiat impresses with high share on larger MPV segment. In Sweden it controlled 14% of the segment, and in Germany, a difficult market due to the VW Sharan and Ford Galaxy/S-Max, the Freemont got a not bad 7,3% of share. In Brazil, it has to compete with the Journey and a few more, as this kind of cars are very expensive over there. As it was a new product, its sales jumped everywhere. First full year on the market means a big jump in sales over 2011 figures. Source: see at the bottom of this post. The Freemont covers the markets where the Journey is no longer available. Source: see at the bottom of this post. Notice the Freemont’s big share in Brazilian, Italian, Turkish and many European D-MPV segments. Source: see at the bottom of this post. 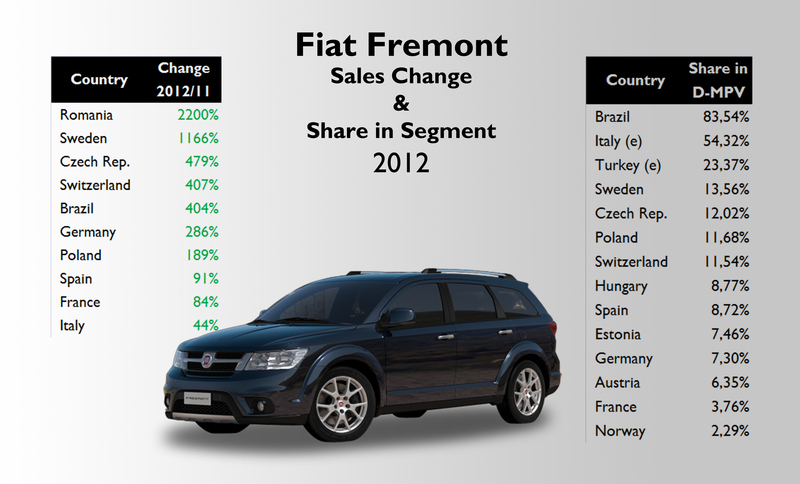 Source: Fiat Group’s World data basis, Best-Selling cars blog, Fenabrave, Autoblog Argentina, UNRAE. Sales of the Fiat Freemont are growing here in Brazil, and this is very good because it holds a diversified market of Fiat cars, where consumers often do not think about buying a Fiat in the SUV segment with the brand by mistrust or lack product knowledge. 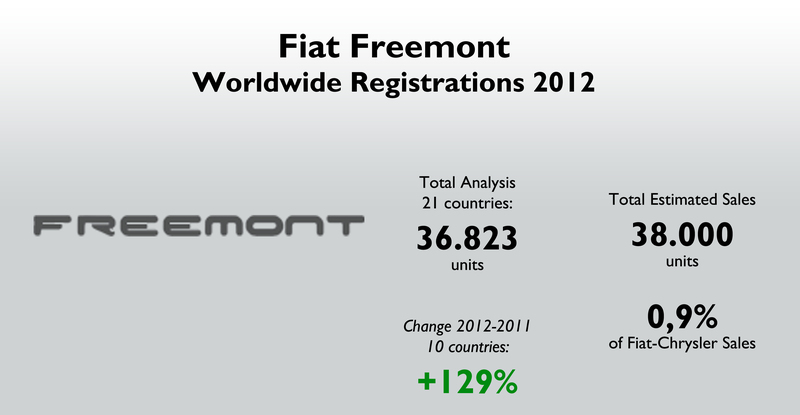 Fiat in Brazil is still seen as a maker of small vehicles, however Freemont helps to slightly change this scenario. The price of Freemont is another factor in the car, with lower price than some of its competitors such as GM Captiva and Honda CR-V. Sorry for the failures in English Juan. No problem Jefferson. I got it. I agree with you: one of the best things of the Freemont is that it is helping Fiat to explore larger segments. Regards! The Freemont/Journey is a capable crossover that has been well received globally. It’s also the best badge engineering move FIAT has made, taking advantage of it’s stronger position (compared to Dodge) in most overseas markets. I’m still amazed how well it’s done with so minimal changes to it’s design or appearance. The only other FIAT badged Dodge is the Viaggio/Tempra (Dart) sold in China and Brasil. It’s somewhat more conservatively styled than the Dart, hopefully giving it better success in these markets. The question I keep wondering about, other than the 500 and Panda, will the FIAT brand rely on Chrysler for future products? Both groups will rely on each other. Why creating 2 posts for Dodge Journey/Fiat Freemont? They are the same car with 170.000 sales. I think it is more interesting and relevant to have the sales data split by the two brands. Given that the Freemont is available in RHD in Australia, its strange that Fiat has decided to not import the car into the UK. The class obsessed english never took to the Dodge Journey, It did not make enough of a statement about their Salaries, the neighbourhoods they live in or the Private Schools their children go to. And thats a great shame because I bought one of the last Dodge Journey’s imported to the UK in the summer of 2010, a Diesel Auto CRD top of the range and we are still driving it in the summer of 2014 the longest I have ever kept a car. Its a fantastic vehicle and its a great great shame the Freemont was never going to be made available here. All the Dodge Journey needed in the UK was a little more refinement to make it a viable choice for X5 and Q7 owners as well as S-Max buyers looking for something that did not resemble a builders van with side windows and extra seats. Next year I will buy a Freemont in Germany, the 4×4 version, and Import it into the UK, I contacted Fiat a few months ago who told me in no uncertain terms they had no intention of making it available for the UK, perhaps the cost of engineering it for RHD relative to the amount of sales it was likely to garner based on the Journey’s take-up, meant that it was never going to be a cost effective opportunity? either way, its a shame, its a car Im sure with correct marketing it would have hit a unique demographic in the UK that would have been loyal and consistent to the Brand. Oh well, roll on next Summer. One of the reasons why the Freemont isn’t available in the UK is because of the high taxes its owners would pay. 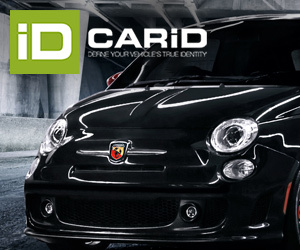 Besides, Fiat brand is well positioned as a city-car brand and I doubt there would a minimum of demand for a big Fiat in the UK. One more thing: Toluca plant, where the Freemont is built, doesn’t produce the left-hand version. Hi Mark – did you import a Freemont in the end and if so would you mind sharing with me how you did this? Many thanks. we decided to import a Dodge Journey from America in the end, I thought the Freemont to be a bit boring and ‘homogenised’ with much of the original ethos of the Dodge removed from it after I had the opportunity to drive one for a few days. If this makes sense but it felt like any regular Eurobox family car. I found a fully loaded 2013 model on Autotrader.com with colour and spec I wanted and used this company ShipMyCar.co.uk to ship it to the UK, the total cost of shipping inc insurance and conversion to UK specs was Five Thousand Pound sterling, which I thought was a great deal. I wish you luck with your purchase.